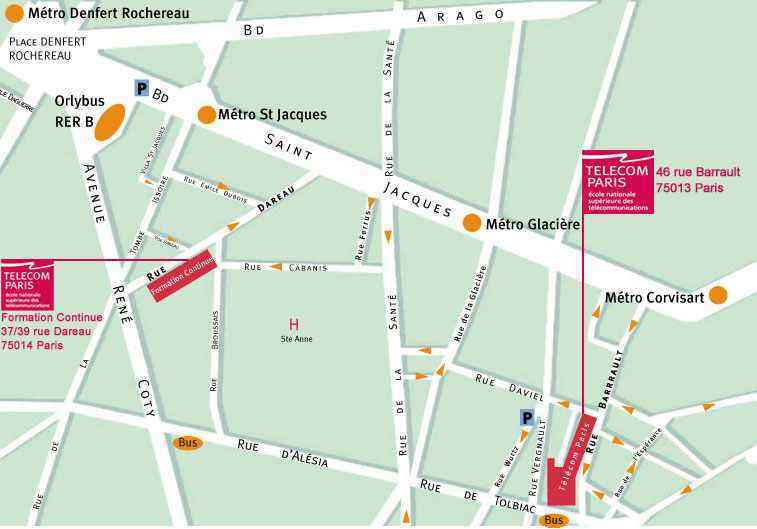 Access rue Barrault opened 0745 AM to 0745 PM;at other times, come to 49 rue Vergniaud. Metro (underground/subway): line 6, station "Corvisart"
RER line B direction "Robinson/St-Remy", set down at "Denfert-Rochereau" station, then change to metro line 6 direction "Nation", set down at "Corvisart" station (approx. 1 hr. - fee 8 € including metro trip). - Orlybus (express bus link), set down at "Denfert-Rochereau" station (terminus), then change to metro line 6 direction "Nation", set down at "Corvisart" station (approx. 35-50 min. - Orlybus fee 5,80 € plus metro fee 1,40 €). Hosted by the National Technical University of Athens.